You're a blogger, what's that? Since starting my little blog a few years ago I feel I have learned so much in this wonderful and inspiring community. Knowing that there are people out there ‘like me’. The same passion for writing about what fuels them, what they love. When I speak to other bloggers online, I find it so refreshing, you come to know them even if it is through a computer screen. I always feel that they just get it. Bizarre as it sounds, it feels like I already know so much about some of them despite never meeting them & vice versa I should imagine. You build friendships, support networks and a place to visit when you feel you need to retire from real life for a short while, write until your hearts content, be in the little world where inspiration, words and pictures help your day that may not have gone to plan. A couple of weeks ago I made the big decision to finally book my first blog event. For me, this is big, A huge leap even. I feel a lot of anxiety for things like this, as my confidence isn’t the biggest amount owned and not to mention leaving my little nest, being without my littles for the day is a big step. A step out of my comfort zone, but one that I know will benefit me in more ways than one. I want to walk in there feeling that I deserve to be in the same room as all those amazing other bloggers, that I shouldn’t feel like im a fraud in the room, that my blog is worthy of being there & to learn & become more successful too. I feel a huge buzz of excitement, nerves, and just a little bit overwhelmed really. I’m not sure what to expect. I’m hopefully going to finally meet up with some lovely bloggers i’ve been speaking to online for a while, I’m particularly really looking forward to learning new things, getting lots of inspiration and to feel the vibe in the room around lots of people just like me. It’s ironic really as this little blog is my real life, but a lot of people hardly know about this space of mine. My closest family and friends don’t really know too much, but are very supportive in what they do know. In every day life the word ‘blogger’ doesn’t really have much understanding, or it has more of a misconception attached to it. I wouldn’t say I’ve ever felt embarrassed, just a little unsure as how to explain what I do, why I do it and what it’s all about in this wonderful little circle. All I know it’s something I feel so much passion for. Its a constant learning curve, albeit I do feel so pressured (often by myself) to meet deadlines, keep up with all the social media side of things, but all in good time. These things come when the time is right. Like I said above, i’ve spoken to so many lovely bloggers the past year or so. They are some of the friendliest people I have ever spoken to. Always there to offer advice, share a joke or just chat to. I’ve officially been blogging since the end of 2012, but only really understood that a blog was more than just me writing a few lines here and there like an online diary about a year ago. It was then that I started to know how to ‘follow’ and read others, network, actually build up the courage to talk to others. I’ve recently been contacted by the lovely Amelia at Oh little one sweet and I feel like we’ve already known each other for years, I really can’t wait to finally meet her at Blogtacular and it’s also going to be our first ever event! Taking that huge leap together! I’m also so pleased to finally be meeting some of the beautiful ladies I’ve been talking to for about a year now, such as Jess, Lucy, Emily, Katie, Morgana, Lucy & Jenny to name a few. I’m sad a few of the other lovely ladies can’t make it too like Zoe, & Hayley. who i’d love to have met! I think I have missed a few, sorry but regardless, I can’t wait to meet you all, honestly. I really do feel like blogging in a way has changed my life, or certainly little aspects of it. It has made me realised that the world can be your oyster. I really look forward to where my blog will be going in the future, I have a few personal projects lined up that i’m doing lots of work to get ready but for now, I will just enjoy to document my life, my happy place and all the things that go with it. An honest look from my eyes with words, and images. Here’s to a fantastic, inspiring and magical time at Blogtacular 2015. 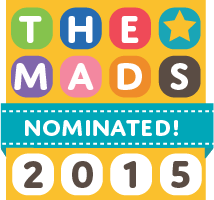 I also couldn’t believe it when I got the tweet to say my little blog has been nominated in the ‘travel’ category in the MAD blog awards! I’m still very shocked as it’s not the category I thought I would’ve even be considered for but really pleased to have been thought about. I’d be really grateful if you fancy giving my blog a vote in the awards as I just think it would an amazing achievement to have! Head on over to the voting page and make sure you share some love for some other amazing bloggers out there, I have done my votes & really wish them all the luck in the world! Thank you to those who have voted me so far, and thank you in advance to anyone who would like to. Have a great time , i can totally relate. I recently went to my first blog event, BlogOn. Everyone is so friendly in the blogging world. Have fun! After many years of faffing around the edges, I'm also doing my first blogger event soon, although I've jumped in feet first and gone straight for BritMums Live. Looking forward to meeting many of the people I've got to know online, but … gulp! Congratulations on your nomination! Good luck in the running. Looking forward to meeting you at Blogtacular! You will love it! I'm out of the loop this year with the new arrival, but went to Britmums last year for the first time and it was so nice to finally meet everyone! Enjoy! Always try to discuss the meeting with those colleagues who'll be attending it with you, as well as others who have useful observations to add. It helps if all of those present in the meeting room can sing from the same hymn sheet.